Are you working on decluttering your home? If you'd like to get organized and make some progress quickly, I suggest that you start in the area of your home that feels the most cluttered first. Recently our master bathroom was making me nutty with clutter- so I took some photos of my quick decluttering project so that I could show you that you can declutter your bathroom in just two hours! Once you start decluttering your home, it starts to take on momentum. You open up cabinets and drawers, and you shudder that you've accumulated SO MUCH STUFF! I mean, how in the world did this happen? And pretty soon you've gone from not even noticing it, to not being able to stand it. You know it is time for a change. 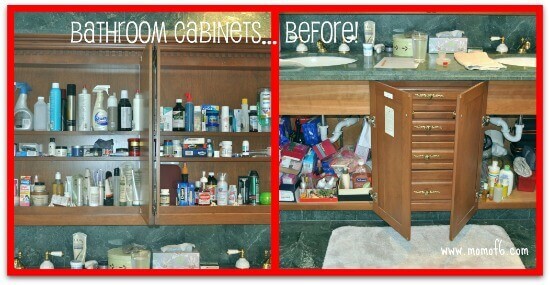 Seriously, how much crap can we stuff into these medicine cabinets? And under the sinks? And how many duplicated items did we own because neither my husband or I ever thought to look into each other's cabinets to find allergy medicine or rubbing alcohol? And how about these drawers? It was amazing that we were ever able to find what we needed! Oh- and how did we decide that the best place to store all of the dog's ear cleaning supplies would be on our windowsill? What- for quick emergency access? As I said, it was time for some decluttering. So here are the steps that I took to conquer this mess in just 2 hours! Start on the left side of the top shelf, removing items and placing them into groups on the floor based on the above categories. Toss out items that are used up, you absolutely never use, are expired, or that you just don't want to keep. 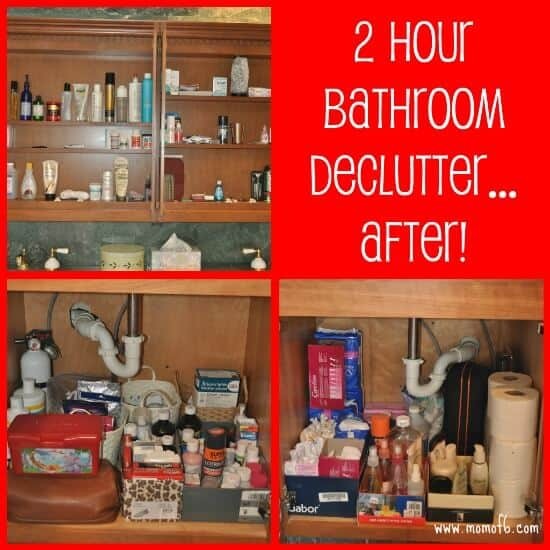 There probably aren't too many items that you'll find in a bathroom decluttering project that are right for donation. But you should separate paper and cardboard items as well as empty plastic and glass containers for recycling wherever possible. Continue emptying the shelves, cabinets, and drawers, sorting items by categories as you go. Every category should be stored in just one spot. Don't put hand cream in both a drawer and under the sink, because you will likely not remember to look in the second storage location when you run out in the main location, and you can end up buying items that you don't need not realizing that you already own them! 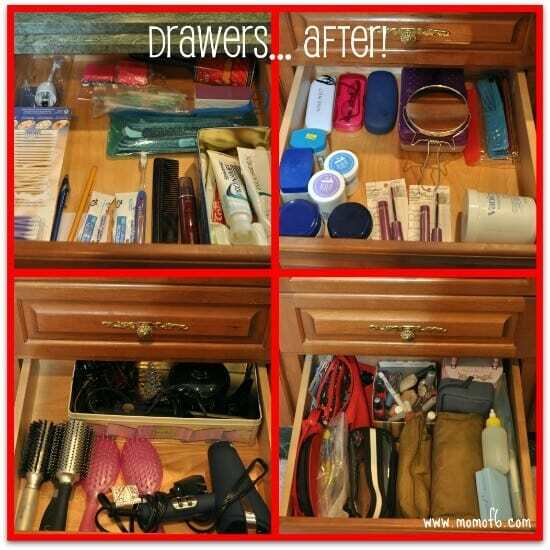 Plan to store everything in a cabinet or a drawer. 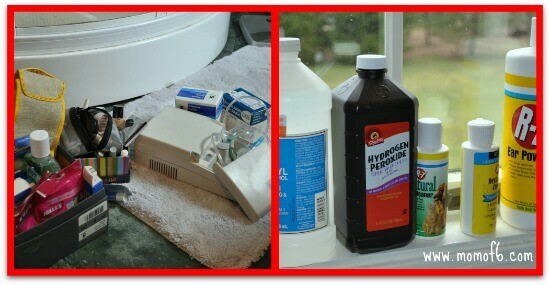 Try to leave almost nothing on your bathroom counter. Hand soap and lotion are really the only things that should be out and available. Everything else should have a neat and accessible home, behind a cabinet door or in a drawer. Ahhh… now, this is more like it! Are you planning on decluttering and organizing? These are my favorite storage bins This is an affiliate link: MomOf6 earns a commission if you purchase, at no additional cost to you. 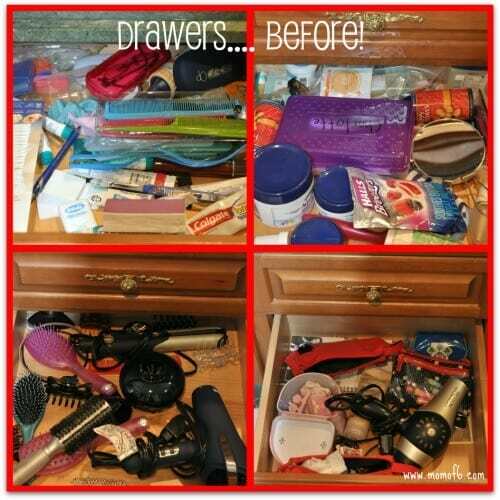 for organizing all of the areas in your home! 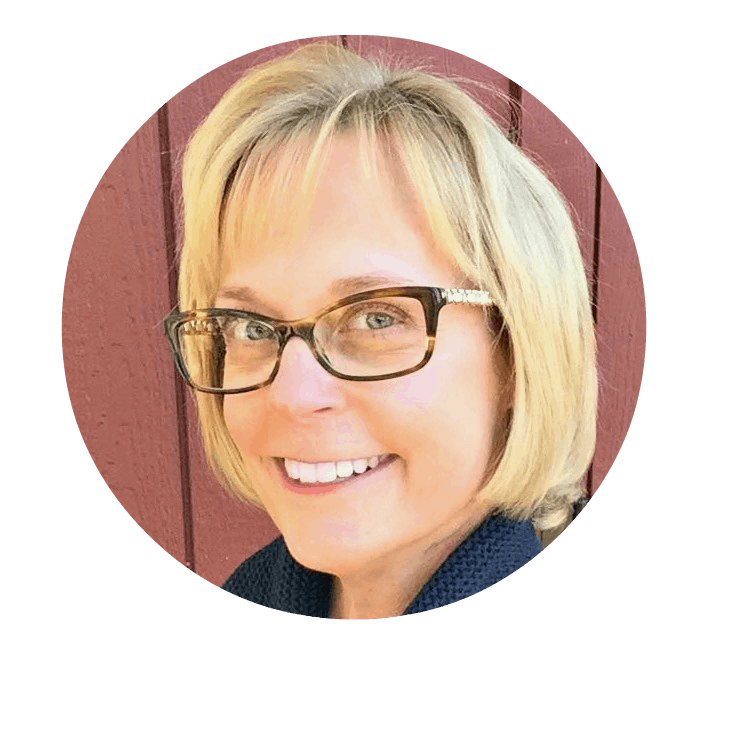 You can see all of my recommendations over on my Amazon Influencer page This is an affiliate link: MomOf6 earns a commission if you purchase, at no additional cost to you. ! What you don't see are the two large trash bags full of garbage and a large recycling container filled too! I can see what I have, find what I need, and know exactly what needs to be replaced. 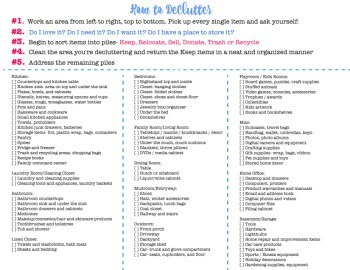 Want my free printable decluttering checklist? Would you like to download a copy of my free printable decluttering checklist? 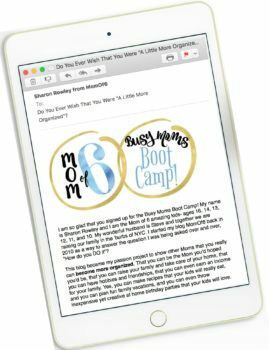 Simply sign up below to join the MomOf6 community and you'll be directed to an access page with instructions! Living in a decluttered home truly allows you to live an organized life. It allows you to find things that you need when you want them, it allows you to think and create more clearly, and it frees the mind! So what do you think? Could you tackle your bathroom in just 2 hours? One hour to remove and sort and one hour to clean and organize? That looks great! The bathroom cabinets are in serious need of cleaning in my house but I haven’t tackled it yet. It’s on the list however. Just putting it on the list is the first step! Of course, some of my target areas have been on my list for nearly a year now! Your system works well for me, too. To just tackle whatever is bothering me at the moment vs trying to find motivation to work on one room at a time. It is amazing what 2 hours concentrated work in one area can do – congratulations! I think this strategy, while not methodical, is what’s going to work best for me in the long run, and certainly makes me feel as if I am tackling my biggest mess! Hi! We did our bathroom products a few weeks ago…mainly because I wanted to get rid of things that had ingredients I don’t like in them. Anyways a few of my friends came over and got shopping bags and had a blast going through it all. It was great to know they were happy to get the stuff and I didn’t just throw it ($$) all away. Your bathroom looks great! Kate- that is such a great idea! I love having someone else take advantage of what you no longer want…. 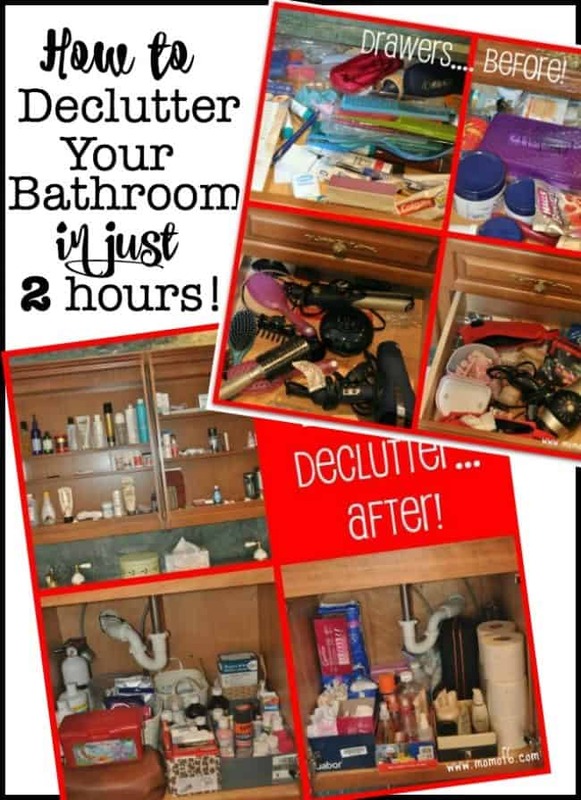 and I also admire the fact that your bathroom makeover came out of the fact that you wanted to get rid of some of the items that had undesirable ingredients in them! Kuddos to you! Awesome job! I like your idea of attacking different areas of the house, not necessarily one room at a time. That is what I have been doing for the past several weeks. I think that for me to clean an entire room I would have to lock my kids out of that room (they are 3 and 19 months) and that really doesn’t work so well. So instead I try and work on what I can when I can! Great tips on the categories too! I hear you! Not only would I need to lock the kids out while I was working on an entire room- but probably after it was done so they wouldn’t clutter-it-all-up again! I figure this is probably going to end up being a constant process…. so if I always focus on the area that is bugging me the most, the overall clutter and chaos level in our home will just keep going down! Next up…. our media cabinet!